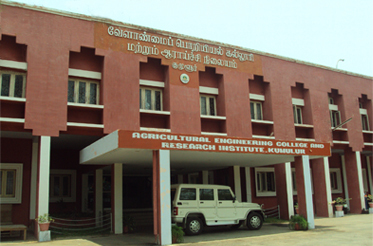 The Agricultural Engineering College and Research Institute was established as a constituent educational institution of the prestigious Tamil Nadu Agricultural University in the academic year of 1972 in Coimbatore. The college was shifted to Kumulur in the year 1992. The campus is at a distance of 25 km from Trichy. This campus has been extended in an area of 280 acres of experimental farm, updated with infrastructural facilities for academic, co-curricular and extra-curricular activities.